A magnetic field is an invisible physical phenomenon caused (“induced”) by an electric current. The current may be as small as an orbiting electron in an atom or as large as that in household wiring or the electric currents flowing in Earth’s core. A magnetic field is detected by the force it produces on a charged particle moving through it or on a magnetic dipole such as a permanent magnet. Magnetic fields, which are measured in the units of Teslas (T), vary widely in strength from about 1/30,000 T for Earth’s magnetic field to 1/100 T for a refrigerator magnet, 1/6 T for the sun, and 50,000 T for white dwarf stars. Earth’s magnetic field protects the planet from the solar wind whose charged particles sometimes do penetrate the shield and follow magnetic field lines toward the poles where their descent produces the dancing “northern lights,” the Aurora Borealis. 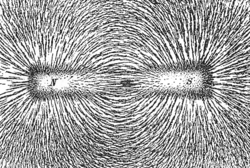 Magnetic and electric fields are highly interactive: A changing magnetic field induces an electric field and a changing electric field induces a magnetic field. When the two fields are directly coupled as perpendicular co-acting vertical waves oscillating and propagating together, they carry energy as electromagnetic radiation in its various forms, from visible light to X-rays and radio waves. Migrating birds and sea turtles, as well as human sailors following a compass, navigate using Earth’s magnetic field as a guide. Understanding and manipulating magnetic fields has been foundational in harnessing electricity to human uses as magnetic fields are active in every electric generator and every electric motor. Magnetic field effects are applied in both microphones for recording sound and loudspeakers for projecting it, and the classic tape recorder used magnetic field effects in recording sound signals onto the tape and later in playing them. Scientific instruments such as cyclotrons, galvanometers, and mass spectrometers use the effects of magnetic fields for studying physical phenomena and analyzing materials. Pulses of strong magnetic fields are used in FMRI (functional magnetic resonance imaging) for monitoring brain activity and in MRI for imaging tissues throughout the body. Iron filings sprinkled onto a sheet of paper covering a bar magnet (a magnetic dipole) outline both the magnet and the otherwise invisible magnetic field lines arching between the magnet's poles (marked N and S). Each iron filing becomes a small magnet itself and aligns with the magnetic field. In common usage, physicists refer to the magnetic field in "empty" space by using the symbol and use a second term, (magnetic field strength), to characterize the magnetic field that passes through a magnetically responsive material, such as iron, which contributes an internal magnetic field. Physicists also refer to as auxiliary magnetic field or magnetizing field. Among electrical engineers is known as the magnetic field intensity or magnetic field strength, and is known as magnetic flux density, magnetic induction, or simply magnetic field, as used by physicists. The magnetic field has the SI units of teslas (T), equivalent to webers per square meter (Wb/m²) or volt seconds per square meter (V s/m²). (The weber is the SI unit of magnetic flux defined as the amount of flux required to induce in a surrounding conducting loop an electromotive force of 1 volt if the flux is reduced to zero over one second.) In cgs units, has units of gauss (G), where 1T = 10,000G. The vector field is measured in Amperes/meter (A/m) in SI or oersted (Oe) in cgs units. A magnetic field belongs mathematically to the class of vector fields, which are defined at each point in their region of occurrence by both a magnitude and a direction. The magnetic field , whose magnitude is measured in Teslas and the magnetic field strength , whose magnitude is measured in Amperes/meter, both therefore are more properly represented by a vector (looking like an arrow) and the full field is represented by many arrows whose directions collectively show the curve of the magnetic field extending between the two magnetic poles. The direction of the magnetic field near the poles of a magnet is revealed by placing compasses nearby. As seen here, the magnetic field points towards a magnet's south pole and away from its north pole. Permanent magnets are objects that produce their own persistent magnetic fields. All permanent magnets have both a north and a south pole. (Magnetic poles always come in north-south pairs.) Like poles repel and opposite poles attract. (See Force on a magnetic dipole due to a non-uniform B below.) The magnetism in a permanent magnet arises from properties of the atoms (in particular the electrons) that compose it. Each atom acts like a little individual magnet. If these magnets line up, they combine to create a macroscopic magnetic effect. For more details about what happens both microscopically and macroscopically, see the article ferromagnetism. If allowed to twist freely, a magnet will turn to point in the direction of the magnetic field at its location. A compass is a small magnet that uses this effect to point in the direction of the local magnetic field. By definition, the direction of the magnetic field at a point is the direction that the north pole of a magnet would want to point. If a compass is placed near the north pole of a magnet then it will point away from that pole—like poles repel. In other words, the magnetic field points away from a magnet near its north pole. The opposite occurs if we place the compass near a magnet's south pole; the magnetic field points towards the magnet near its south pole. Not all magnetic fields are describable in terms of poles, though. A straight current-carrying wire, for instance, produces a magnetic field that points neither towards nor away from the wire, but encircles it instead. The strength and direction of the magnetic field due to an object varies from position to position. Mapping out this magnetic field is simple in principle. First, measure the strength and direction of the magnetic field at a large number of points. 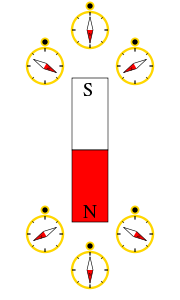 Then mark each location with an arrow (called a vector) pointing in the direction of the magnetic field with a length proportional to the strength of the magnetic field. This is a valid and useful way of marking out and visualizing the magnetic field of an object. It has the unfortunate consequence, though, of cluttering up a graph even when using a small number of points. An alternative method of visualizing the magnetic field is to use "magnetic field lines." Various physical phenomena have the effect of displaying magnetic field lines. For example, iron filings placed in a magnetic field will line up in such a way as to visually show the orientation of the magnetic field (see figure at top). Another place where magnetic fields are visually displayed is in the polar auroras, in which visible streaks of light line up with the local direction of Earth's magnetic field (due to plasma particle dipole interactions). In these phenomena, lines or curves appear that follow along the direction of the local magnetic field. These field lines provide us with a way to depict or draw the magnetic field (or any other vector field). Technically, field lines are a set of lines through space whose direction at any point is the direction of the local magnetic field, and whose density is proportional to the magnitude of the local magnetic field. Note that when a magnetic field is depicted with field lines, it is not meant to imply that the field is only nonzero along the drawn-in field lines. (The use of iron filings to display a field presents something of an exception to this picture: The magnetic field is in fact much larger along the "lines" of iron, due to the large permeability of iron relative to air.) Rather, the field is typically smooth and continuous everywhere, and can be estimated at any point (whether on a field line or not) by looking at the direction and density of the field lines nearby. The choice of which field lines to draw in such a depiction is arbitrary, apart from the requirement that they be spaced out so that their density approximates the magnitude of the local field. The level of detail at which the magnetic field is depicted can be increased by increasing the number of lines. Field lines are a useful way to represent any vector field and can often be used to reveal sophisticated properties of that field quite simply. One important property of the magnetic field that can be verified with field lines is that it always makes complete loops. Magnetic field lines neither start nor end (although they can extend to or from infinity). To date no exception to this rule has been found. Since magnetic field lines always come in loops, magnetic poles always come in N and S pairs. If a magnetic field line enters a magnet somewhere it has to leave the magnet somewhere else; it is not allowed to have an end point. For this reason as well, cutting a magnet in half will result in two separate magnets each with both a north and a south pole. Field lines are also a good tool for visualizing magnetic forces. When dealing with magnetic fields in ferromagnetic substances like iron, and in plasmas, the magnetic forces can be understood by imagining that the field lines exert a tension, (like a rubber band) along their length, and a pressure perpendicular to their length on neighboring field lines. The "unlike" poles of magnets attract because they are linked by many field lines, while "like" poles repel because the field lines between them don't meet, but run parallel, pushing on each other. A sketch of Earth's magnetic field representing the source of Earth's magnetic field as a magnet. The north pole of earth is near the top of the diagram, the south pole near the bottom. Notice that the south pole of that magnet is deep in Earth's interior below Earth's North Magnetic Pole. Earth's magnetic field is produced in the outer liquid part of its core due to a dynamo that produce electrical currents there. Because of Earth's magnetic field, a compass placed anywhere on Earth will turn so that the "north pole" of the magnet inside the compass points roughly north, toward Earth's north magnetic pole in northern Canada. 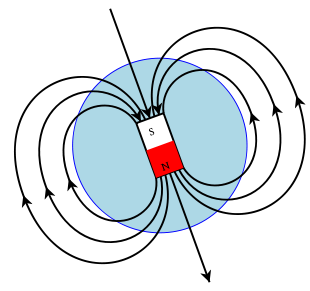 This is the traditional definition of the "north pole" of a magnet, although other equivalent definitions are also possible. One confusion that arises from this definition is that if Earth itself is considered as a magnet, the south pole of that magnet would be the one nearer the north magnetic pole, and vice-versa. (Opposite poles attract and the north pole of the compass magnet is attracted to the north magnetic pole.) The north magnetic pole is so named not because of the polarity of the field there but because of its geographical location. The figure to the right is a sketch of Earth's magnetic field represented by field lines. The magnetic field at any given point does not point straight toward (or away) from the poles and has a significant up/down component for most locations. (In addition, there is an East/West component as Earth's magnetic poles do not coincide exactly with Earth's geological pole.) The magnetic field is as if there were a magnet deep in Earth's interior. Earth's magnetic field is probably due to a dynamo that produces electric currents in the outer liquid part of its core. Earth's magnetic field is not constant: Its strength and the location of its poles vary. The poles even periodically reverse direction, in a process called geomagnetic reversal. A magnetic field has many effects on materials and on individual particles. All of these effects can be expressed due to its affects on elementary charges and magnetic dipoles. There are four elementary ways that a magnetic field can affect a charge or a magnetic dipole. A charged particle moving in a magnetic field will feel a sideways force that is proportional to the strength of the magnetic field, the component of the velocity that is perpendicular to the magnetic field and the charge of the particle. This force is known as the Lorentz Force. The force is always perpendicular to both the velocity of the particle and the magnetic field that created it. Neither a stationary particle nor one moving in the direction of the magnetic field lines will experience a force. For that reason, charged particles move in a circle (or more generally, helix) around magnetic field lines; this is called cyclotron motion. Because the magnetic field is always perpendicular to the motion, the magnetic fields can do no work on a charged particle; a magnetic field alone cannot speed up or slow down a charged particle. It can and does, however, change the particle's direction, even to the extent that a force applied in one direction can cause the particle to drift in a perpendicular direction. The force on a current carrying wire is similar to that of a moving charge as expected since a charge carrying wire is a collection of moving charges. A current carrying wire will feel a sideways force in the presence of a magnetic field. The Lorentz force on a macroscopic current is often referred to as the Laplace force. The right-hand rule: For a conventional current or moving positive charge in the direction of the thumb of the right hand and the magnetic field along the direction of the fingers (pointing away from palm) the force on the current will be in a direction out of the palm. The direction of the force is reversed for a negative charge. The direction of force on a positive charge or a current is determined by the right-hand rule. See the figure on the right. Using the right hand and pointing the thumb in the direction of the moving positive charge or positive current and the fingers in the direction of the magnetic field the resulting force on the charge will point outwards from the palm. The force on a negative charged particle is in the opposite direction. If both the speed and the charge are reversed then the direction of the force remains the same. For that reason a magnetic field measurement (by itself) cannot distinguish whether there is a positive charge moving to the right or a negative charge moving to the left. (Both of these will produce the same current.) On the other hand, a magnetic field combined with an electric field can distinguish between these, see Hall effect below. An alternative, similar trick to the right hand rule is Fleming's left hand rule. A magnet placed in a magnetic field will feel a torque that will try to align the magnet with the magnetic field. The torque on a magnet due to an external magnetic field is easy to observe by placing two magnets near each other while allowing one to rotate. This magnetic torque is the basis for how compasses work. It is used to define the direction of the magnetic field (see above). The magnetic torque also provides the driving torque for simple electric motors. A magnet (called a rotor) placed on a rotating shaft will feel a strong torque if like poles are placed near its own poles. If the magnet that caused the rotation—called the stator—is constantly being flipped such that it always has like poles close to the rotor then the rotor will generate a torque that is transferred to the shaft. The polarity of the rotor can easily be flipped if it is an electromagnet by flipping the direction of the current through its coils. See Rotating magnetic fields below for an example using this effect with electromagnets. A more physically accurate picture would be based on the fundamental fact that a magnetic dipole experiences a force, when placed in a non-uniform external magnetic field. (In a uniform field, it will experience a torque but no force.) The south pole of one magnet is attracted to the north pole of another magnet because of the specific way in which each of the microscopic dipoles in either magnet responds to the non-uniform field of the other magnet. The force on a magnetic dipole does not depend directly on the strength or direction of the magnetic field, but only on how these vary with location. A magnet will move to maximize the magnetic field in the direction of its magnetic moment. Care should be taken to distinguish the magnetic force on a magnetic dipole from the magnetic force on a moving charge. The magnetic force on a charge only occurs when the charge is moving and is in a sideways direction. It is felt for both uniform and non-uniform magnetic fields. The magnetic force on a dipole, on the other hand, is present only in non-uniform (in space) fields and is in the direction that increases the component of the magnetic field in the direction parallel to the dipole's magnetic moment. Neither does the force on a magnetic dipole depend on its speed (except at velocities approaching the speed of light). If the magnetic field in an area is varying with time it generates an electric field that forms closed loops around that area. A conducting wire that forms a closed loop around the area will have an induced voltage generated by this changing magnetic field. This effect is represented mathematically as Faraday's Law and forms the basis of many generators. Care must be taken to understand that the changing magnetic field is a source for an extended electric field. The changing magnetic field does not only create an electric field at that location; rather it generates an electric field that forms closed loops around the location where the magnetic field is changing. Mathematically, Faraday's law is most often represented in terms of the change of magnetic flux with time. The magnetic flux is the property of a closed loop (say of a coil of wire) and is the product of the area times the magnetic field that is normal to that area. Engineers and physicists often use magnetic flux as a convenient physical property of a loop(s). They then express the magnetic field as the magnetic flux per unit area. It is for this reason that the field is often referred to as the "magnetic flux density." This approach has the benefit of making certain calculations easier such as in magnetic circuits. It is typically not used outside of electrical circuits, though, because the magnetic field truly is the more "fundamental" quantity in that it directly connects all of electrodynamics in the simplest manner. Magnetic fields can be created in a number of different ways. All of these ways are based on three elementary ways to create a magnetic field. These sources are thought to affect the virtual particles that compose the field. All moving charges produce a magnetic field. The magnetic field of a moving charge is very complicated but is well known. (See Jefimenko's equations.) It forms closed loops around a line that is pointing in the direction the charge is moving. The magnetic field of a current on the other hand is much easier to calculate. Current (I) through a wire produces a magnetic field ( ) around the wire. The field is oriented according to the right hand grip rule. The magnetic field generated by a steady current (a continual flow of charges, for example through a wire, which is constant in time and in which charge is neither building up nor depleting at any point), is described by the Biot-Savart law. This is a consequence of Ampere's law, one of the four Maxwell's equations that describe electricity and magnetism. The magnetic field lines generated by a current carrying wire form concentric circles around the wire. The direction of the magnetic field of the loops is determined by the right hand grip rule. (See figure to the right.) The strength of the magnetic field decreases with distance from the wire. A current carrying wire can be bent in a loop such that the field is concentrated (and in the same direction) inside of the loop. The field will be weaker outside of the loop. Stacking many such loops to form a solenoid (or long coil) can greatly increase the magnetic field in the center and decrease the magnetic field outside of the solenoid. Such devices are called electromagnets and are extremely important in generating strong and well controlled magnetic fields. An infinitely long solenoid will have a uniform magnetic field inside of the loops and no magnetic field outside. A finite length electromagnet will produce essentially the same magnetic field as a uniform permanent magnet of the same shape and size. An electromagnet has the advantage, though, that you can easily vary the strength (even creating a field in the opposite direction) simply by controlling the input current. One important use is to continually switch the polarity of a stationary electromagnet to force a rotating permanent magnet to continually rotate using the fact that opposite poles attract and like poles repel. This can be used to create an important type of electrical motor. 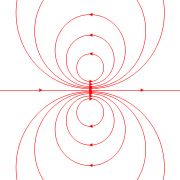 Magnetic field lines around a ”magnetostatic dipole” the magnetic dipole itself is in the center and is seen from the side. The magnetic field due to a permanent magnet is well known. (See the first figure of article.) But, what causes the magnetic field of a permanent magnet? The answer again is that the magnetic field is essentially created due to currents. But this time it is due to the cumulative effect of many small "currents" of electrons "orbiting" the nuclei of the magnetic material. Alternatively it is due to the structure of the electron itself which, in some sense, can be thought of as forming a tiny loop of current. (The true nature of the electron's magnetic field is relativistic in nature, but this model often works.) Both of these tiny loops are modeled in terms of what is called the magnetic dipole. The dipole moment of that dipole can be defined as the current times the area of the loop, then an equation for the magnetic field due to that magnetic dipole can be derived. (See the above image for what that magnetic field looks like.) Magnetic field of a larger magnet can be calculated by adding up the magnetic fields of many magnetic dipoles. The final known source of magnetic fields is a changing electric field. Just as a changing magnetic field generates an electric field so does a changing electric field generate a magnetic field. (These two effects bootstrap together to form electromagnetic waves, such as light.) Similar to the way magnetic field lines form close loops around a current a time varying electric field generates a magnetic field that forms closed loops around the region where the electric field is changing. The strength of this magnetic field is proportional to the time rate of the change of the electric field (which is called the displacement current). The fact that a changing electric field creates a magnetic field is known as Maxwell's correction to Ampere's Law. The magnetic monopole is a hypothetical particle (it may or may not exist). A magnetic monopole would have, as its name suggests, only one pole. In other words, it would possess "magnetic charge" analogous to electric charge. Positive magnetic charge would correspond to an isolated north pole, and negative magnetic charge would correspond to an isolated south pole. There are several different but physically equivalent ways to define the magnetic field. In principle any of the above effects due to the magnetic field or any of the sources of the magnetic field can be used to define its magnitude and the direction. Its direction at a given point can be thought of as being the direction that a hypothetical freely rotating small test dipole would rotate to point if it were placed at that point. Its magnitude is defined (in SI units) in terms of the voltage induced per unit area on a current carrying loop in a uniform magnetic field normal to the loop when the magnetic field is reduced to zero in a unit amount of time. The SI unit of magnetic field is the Tesla. The magnetic field vector is a pseudovector (also called an axial vector). (This is a technical statement about how the magnetic field behaves when you reflect the world in a mirror.) This fact is apparent from many of the definitions and properties of the field; for example, the magnitude of the field is proportional to the torque on a dipole, and torque is a well-known pseudovector. As discussed above, the magnetic field is a vector field. (The magnetic field at each point in space and time is represented by its own vector.) As a vector field, the magnetic field has two important mathematical properties. These properties, along with the corresponding properties of the electric field, make up Maxwell's Equations. The first is that the magnetic field never starts nor ends at a point. Whatever magnetic field lines enter a region has to eventually leave that region. This is mathematically equivalent to saying that the divergence of the magnetic is zero. (Such vector fields are called solenoidal vector fields.) This property is called Gauss' law for magnetism and is one of Maxwell's Equations. It is also equivalent to the statement that there are no magnetic monopoles (see above). The second mathematical property of the magnetic field is that it always loops around the source that creates it. This source could be a current, a magnet, or a changing electric field, but it is always within the loops of magnetic field they create. Mathematically, this fact is described by the Ampère-Maxwell equation. There are many ways of measuring the magnetic field, many of which use the effects described above. Devices used to measure the local magnetic field are called magnetometers. Important magnetometers include using a rotating coil, Hall effect magnetometers, NMR magnetometer, SQUID magnetometer, and a fluxgate magnetometer. The magnetic fields of distant astronomical objects can be determined by noting their effects on local charged particles. For instance, electrons spiraling around a field line will produce synchotron radiation which is detectable in radio waves. Because the Lorentz force is charge-sign-dependent (see above), it results in charge separation when a conductor with current is placed in a transverse magnetic field, with a buildup of opposite charges on two opposite sides of conductor in the direction normal to the magnetic field, and the potential difference between these sides can be measured. The Hall effect is often used to measure the magnitude of a magnetic field as well as to find the sign of the dominant charge carriers in semiconductors (negative electrons or positive holes). Superconductors are materials with both distinctive electric properties (perfect conductivity) and magnetic properties (such as the Meissner effect, in which many superconductors can perfectly expel magnetic fields). Due to these properties, it turns out that loops that incorporate superconducting material and their Josephson junctions can function as very sensitive magnetometers, called SQUIDs. where is magnetization density of any magnetic material. The magnetic is useful because it treats these two types of currents differently. The free currents it treats in the normal fashion and therefore has the same form as the magnetic field it would generate. The magnetic fields treats the field inside of a magnetic material (due to that magnetic material) in a manner similar to the Gilbert model. (By subtracting the magnetization from the B field we are essentially converting the bound current sources to Gilbert-like magnetic charges at the poles.) 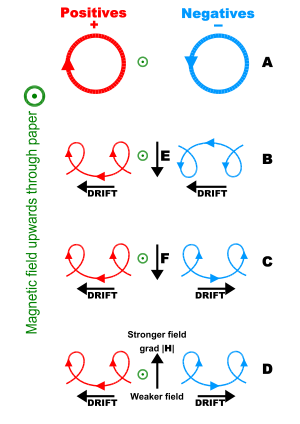 Unlike the magnetic , which always forms closed loops, the field due to the magnetic charges flow outward (or inward depending on the sign of the magnetic charge) in both directions from the poles. And while the magnetic field is exactly the same on the outside of the magnetic material for both models the magnetic fields inside are quite different. Putting both sources together we see that the magnetic field is the same as the magnetic field to a multiplicative constant outside of magnetic materials, but is completely different from the magnetic field inside a magnetic material. The advantage of this hybrid field is that these sources are treated so differently that we can often pick out one source from the other. For example a line integral of the magnetic field in a closed loop will yield the total free current in the loop (and not the bound current). This is unlike the magnetic field where a similar integral will yield the sum of both the free and the bound current. If one wants to isolate the contribution due to the bound currents then a surface integral of over any closed surface will pick out the "magnetic charges" at the poles. Unlike the magnetic field that only has a current source such that the magnetic field loops around currents, the magnetic field has two types of sources. The first source of magnetic field are the free currents for which loop around similar to the way field loops around the total current. The second source of the magnetic field are "magnetic charges" near the poles of the magnetic material. More precisely, these "magnetic charges" are calculated as . In order to create a magnetic field we need to do work to establish a free current. If one were to ask how much energy does it take to create a specific magnetic field using a particular free current then one needs to distinguish between the free and the bound currents. It is the free current that one is "pushing" on. The bound currents are freeloaders. They create a magnetic field that the free current has to work against without doing any of the work. If one was to calculate the energy of creating a magnetic field we need to have a way of separating out the free current. The magnetic cannot be used to determine this free current since does not distinguish between bound and free current. where is the magnetic flux in the circuit, is the magnetomotive force applied to the circuit, and is the reluctance of the circuit. Here the reluctance is a quantity similar in nature to resistance for the flux. Using this analogy it is straight-forward to calculate the magnetic flux of complicated magnetic field geometries, by using all the available techniques of circuit theory. where is electric charge density. was seen as a kind of magnetic current of vortices aligned in their axial planes, with being the circumferential velocity of the vortices. With µ representing vortex density, we can now see how the product of µ with vorticity leads to the term magnetic flux density which we denote as . The electric current equation can be viewed as a convective current of electric charge that involves linear motion. By analogy, the magnetic equation is an inductive current involving spin. There is no linear motion in the inductive current along the direction of the vector. The magnetic inductive current represents lines of force. In particular, it represents lines of inverse square law force. The extension of the above considerations confirms that where is to , and where is to ρ, then it necessarily follows from Gauss's law and from the equation of continuity of charge that is to . ie. parallels with , whereas parallels with . The rotating magnetic field is a key principle in the operation of alternating-current motors. A permanent magnet in such a field will rotate so as to maintain its alignment with the external field. This effect was conceptualized by Nikola Tesla, and later utilized in his, and others', early AC (alternating-current) electric motors. A rotating magnetic field can be constructed using two orthogonal coils with 90 degrees phase difference in their AC currents. However, in practice such a system would be supplied through a three-wire arrangement with unequal currents. This inequality would cause serious problems in standardization of the conductor size and so, in order to overcome it, three-phase systems are used where the three currents are equal in magnitude and have 120 degrees phase difference. Three similar coils having mutual geometrical angles of 120 degrees will create the rotating magnetic field in this case. The ability of the three-phase system to create a rotating field, utilized in electric motors, is one of the main reasons why three-phase systems dominate the world's electrical power supply systems. Because magnets degrade with time, synchronous motors and induction motors use short-circuited rotors (instead of a magnet) following the rotating magnetic field of a multicoiled stator. 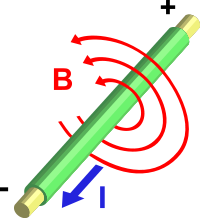 The short-circuited turns of the rotor develop eddy currents in the rotating field of the stator, and these currents in turn move the rotor by the Lorentz force. In 1882, Nikola Tesla identified the concept of the rotating magnetic field. In 1885, Galileo Ferraris independently researched the concept. In 1888, Tesla gained U.S. Patent 381968 (PDF) for his work. Also in 1888, Ferraris published his research in a paper to the Royal Academy of Sciences in Turin. Magnetic fields played an important role in helping to develop the theory of special relativity. Imagine a moving conducting loop that is passing by a stationary magnet. Such a conducting loop will have a current generated in it as it passes through the magnetic field. But why? It is answering this seemingly innocent question that led Albert Einstein to develop his theory of special relativity. A stationary observer would see an unchanging magnetic field and a moving conducting loop. Since the loop is moving all of the charges that make up the loop are also moving. Each of these charges will have a sideways, Lorentz force, acting on it which generates the current. Meanwhile, an observer on the moving reference frame would see a changing magnetic field and stationary charges. (The loop is not moving in this observers reference frame. The magnet is.) This changing magnetic field generates an electric field. The stationary observer claims there is only a magnetic field that creates a magnetic force on a moving charge. The moving observer claims that there is both a magnetic and an electric field but all of the force is due to the electric field. Which is true? Does the electric field exist or not? The answer, according to special relativity, is that both observers are right from their reference frame. A pure magnetic field in one reference can be a mixture of magnetic and electric field in another reference frame. According to special relativity, electric and magnetic forces are part of a single physical phenomenon, electromagnetism; an electric force perceived by one observer will be perceived by another observer in a different frame of reference as a mixture of electric and magnetic forces. A magnetic force can be considered as simply the relativistic part of an electric force when the latter is seen by a moving observer. More specifically, rather than treating the electric and magnetic fields as separate fields, special relativity shows that they naturally mix together into a rank-2 tensor, called the electromagnetic tensor. This is analogous to the way that special relativity "mixes" space and time into spacetime, and mass, momentum and energy into four-momentum. 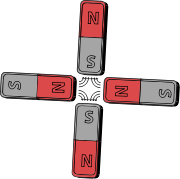 Schematic quadrupole magnet("four-pole") magnetic field. There are four steel pole tips, two opposing magnetic north poles and two opposing magnetic south poles. An azimuthal magnetic field is one that runs east-west. A meridional magnetic field is one that runs north-south. In the solar dynamo model of the Sun, differential rotation of the solar plasma causes the meridional magnetic field to stretch into an azimuthal magnetic field, a process called the omega-effect. The reverse process is called the alpha-effect. A dipole magnetic field is one seen around a bar magnet or around a charged elementary particle with nonzero spin. A quadrupole magnetic field is one seen, for example, between the poles of four bar magnets. The field strength grows linearly with the radial distance from its longitudinal axis. A solenoidal magnetic field is similar to a dipole magnetic field, except that a solid bar magnet is replaced by a hollow electromagnetic coil magnet. A toroidal magnetic field occurs in a doughnut-shaped coil, the electric current spiraling around the tube-like surface, and is found, for example, in a tokamak. A poloidal magnetic field is generated by a current flowing in a ring, and is found, for example, in a tokamak. A radial magnetic field is one in which the field lines are directed from the center outwards, similar to the spokes in a bicycle wheel. An example can be found in a loudspeaker transducers (driver). A helical magnetic field is corkscrew-shaped, and sometimes seen in space plasmas such as the Orion Molecular Cloud. ↑ GSU, Magnetic Field Strength H, hyperphysics.phy-astr.gsu.edu. Retrieved November 15, 2008. ↑ TechTarget, What is magnetic field strength? Retrieved November 15, 2008. ↑ Unit Conversion, Magnetic Field Strength Converter. Retrieved November 15, 2008. ↑ In special relativity this means that the electrical field and the magnetic field must be two parts of the same phenomenon. For a moving single charge or charges moving together we can always shift to a reference system in which they are not moving. In that reference system there is no magnetic field. Yet, the physics has to be the same in all reference systems. It turns out the electric field changes as well which produces the same force in the original reference frame. It is probably a mistake, though, to say that the electric field causes the magnetic field when relativity is accounted for, since relativity favors no particular reference frame. (One could just as easily say that the magnetic field caused an electric field). More importantly it is not always possible to move into a coordinate system in which all of the charges are stationary. See classical electromagnetism and special relativity for more information. ↑ In practice, the Biot-Savart law and other laws of magnetostatics can often be used even when the charge is changing in time as long as it is not changing too quickly. This situation is known as being quasistatic. ↑ In the ether model the displacement current is a real current that occurs because the electric field "displaces" positive charge in one direction and negative charge in the opposite direction in the ether. A change in the electric field will then shift these charges around causing a current in the ether. This model can still be useful even though it is incorrect in that it helps to give a better understanding of the displacement field. ↑ I.S. Falconer, M.I. Large, and I.M. Sefton (eds. ), Magnetism: Fields and Forces, Lecture E6, The University of Sydney. Retrieved November 15, 2008. ↑ Robert Sanders, Astronomers find magnetic Slinky in Orion, UC Berkeley. Retrieved November 15, 2008. Durney, Carl H. and Curtis C. Johnson. 1969. Introduction to Modern Electromagnetics. New York, NY: McGraw-Hill. Furlani, Edward P. 2001. Permanent Magnet and Electromechanical Devices: Materials, Analysis and Applications. San Diego, CA: Academic. ISBN 0122699513. Griffiths, David J. 1999. Introduction to Electrodynamics, 3rd ed. Upper Saddle River, NJ: Prentice Hall. ISBN 013805326X. Jackson, John D. 1999. Classical Electrodynamics, 3rd ed. New York, NY: Wiley. ISBN 047130932X. Jiles, David. 1994. Introduction to Electronic Properties of Materials. London, UK: Chapman & Hall. ISBN 0412495805. Nave, R. Magnetic Field Strength H. hyperphysics.phy-astr.gsu.edu. Retrieved November 15, 2008. Oppelt, Arnulf. 2006-11-02. Magnetic field strength. Retrieved November 15, 2008. Rao, Nannapaneni N. 1994. Elements of Engineering Electromagnetics, 4th ed. Englewood Cliffs, NJ: Prentice Hall. ISBN 0139487468. Unit Conversion. Magnetic field strength converter. Retrieved November 15, 2008. Nave, R. Magnetic Field. HyperPhysics. "Magnetism." The Magnetic Field. theory.uwinnipeg.ca. Rotating magnetic fields. Integrated Publishing. "AC Motor Theory." Figure 2 Rotating Magnetic Field. Integrated Publishing. Melle, Sonia, Miguel A. Rubio, and Gerald G. Fuller. 2000. Structure and dynamics of magnetorheological fluids in rotating magnetic fields. Phys. Rev. E 61:4111–4117. This page was last modified on 7 August 2018, at 18:09.